In 1990, an extraordinarily talented young man was discovered on the streets of Florence, Italy. His gifts are readily apparent, his ability to lead unmatched, and the possibilities for his future endless. Several years later, a group of scholars at Harvard known as La Fratellanza devise a brilliant thesis in the form of an intellectual game. When the game morphs into a real-life experience with the election of President Abner Baari, no one could have foreseen the consequences—or ramifications. Director Hamilton Scott of the States Intelligence Agency is dispatched to Florence to coordinate a sting operation with Interpol to trap a terrorist, but as he digs deeper, he finds himself in a complicated mystery that has the fate of the United States, even that of the president himself, on his shoulders. As Hamilton drives the investigation forward with clear-headed integrity, Brotherhood Beyond the Yard provides an array of disturbing possibilities while delivering a rush of thrills. Sally Fernandez’s crackerjack international thriller expertly weaves seemingly disparate events into a cohesive whole leading to a shocking, shattering climax; a classic blend of character study and well-plotted action sequences keeps the pages turning faster and faster. There are no sacred cows here as Fernandez drives straight to the highest seats of Washington and questions anyone—and everything. 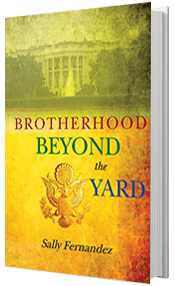 A hair-raising page-turner from start to finish, Brotherhood Beyond the Yard examines political ideology, the international banking crisis, the role of Internet technology, and international terrorism with ferocious insight. It is the first book in “The Simon Tetralogy”.